Same Show, New Climate - ROSEANNE Premiere Sneak-Peek! THIS REVIEW CONTAINS SPOILERS! SPOILER ALERT! “Roseanne” sitcom which is executive produced by its star/comedian Roseanne Barr isn’t trying to reinvent itself, nor is it trying to be a new kind of edgy by one-upping itself. That’s a good thing because the show that audiences fell in love with over twenty years ago was lucky enough to get it’s main ingredients back that made it such a hit – the writing and the ensemble. Familiarity is the ongoing theme. 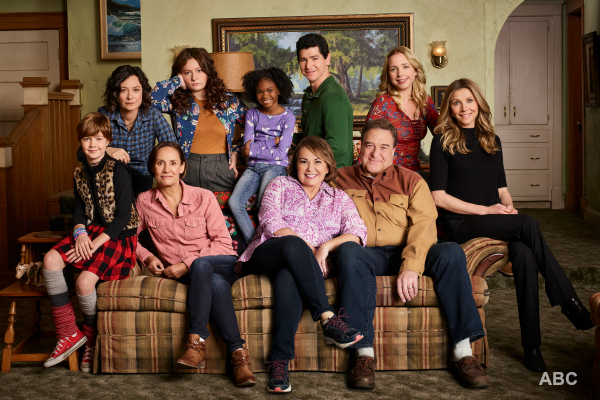 The show’s opening credits keeps its one-shot style with the original cast along with expanded family members in the kitchen with our main player, Roseanne at the head displaying that signature laugh. In the new “Roseanne” premiere episode, the opening shot consists only of that all so basic living room and couch with the crochet afghan front and center. The household, as it has always been, remains the mainstay of where most of the action takes place. While ground-breaking in it’s time, being ground-breaking today is a bit of a tougher feat to achieve with all the desensitization that social meida has given everyone. So, “Roseanne” does what it has always done best. The cast was such a well-known and successful ensemble in it’s original airing and the magic created between a cast is key in making or breaking a show. “Roseanne” was lucky enough to have all the orginal players back. This even included special scenes with both actresses – Sarah Chalke and Alicia Goranson that both portrayed Becky (or “Rebecca”) Conner at different times in the series. This was always a running gag and acknowledged multiple times. So, having the two women together in one scene is a special treat. The first episodes of the show reveal the new problems the family is currently facing, and they should hit close to home to many Americans. 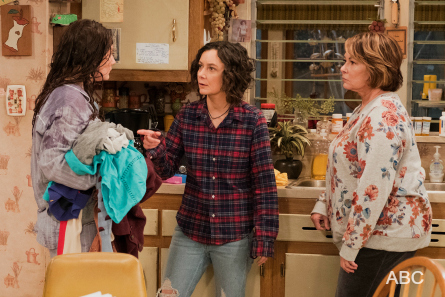 Darlene has lost her job, Roseanne explains how they almost lost their house, and the family constantly bickers. Sound familiar? The show was always well liked because they had real problems. They were the type of family many people could relate to. Unlike many sitcoms before them (“The Cosby Show”, “Growing Pains”, “The Brady Bunch”) the Conners failed to present a fabricated image of what family is supposed to be. Television is notorious for lying. The Conners always felt real. They never hid behind a pearly white smile, and Ralph Lauren jeans. 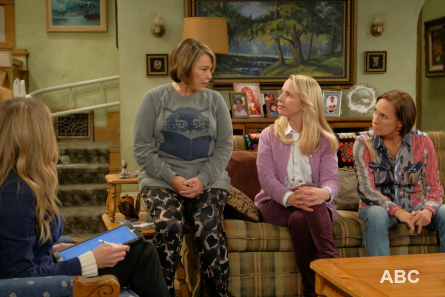 Watching the new “Roseanne” gives audiences from the show’s first-run a getting re-acquainted with old friends and family type of mood. The show picks-up in today’s changed world. But, within a time capsule of the old “Roseanne” household. In the outside world, everything has changed. However, inside, everything remains the same which gives audiences a nice feeling of constant. Kind of like when you visit your grandparents. Which, Roseanne and Dan are now, by the way, and we get a view into that world as they ease into Senior citizenship. Some of the hot topis and modern concerns that viewers will see throughout the season include: gender identity, homosexuality, economics, women’s movement, politics, and drug addiction. It’s all done in the unique and raw, yet looking through rose-colored glasses kind of way that “Roseanne” is known for. The comedy is on point and can be funny leading into serious topics. Then serious topics leading into more hysterics. An element that the show always did so well. Audiences will get to see where daughers Darlene and Becky landed in life and how they are currently coping. Their son D.J. is also all grown-up with a child of his own (hard to believe!). Roseanne and Dan, along with her sister Jackie, as always, are there to help navigate and give some abrasive advice to the kids. Jackie and Roseanne have a riff based on the last presidental election which is addressed in the premiere episode. One voted for blue, the other for red. Remember when Roseanne was always working on that manuscript? Well, fans will also find out what happened with that. It’s anticipated that by the end of the first season, viewers will be fully caught-up with most of the puzzle pieces filled in. Possibly getting more in depth on Darlene being a singe mom. Becky working at a Mexican resturant trying to get her head above water, and the backstory to D.J. in his time in the Army. The half-hour premiere episode is a nice re-introduction to the Conners as well as a perfect warm-up to the intricate lives of this family and a tease of what’s to come as their stories unfold over the course of the season. “Roseanne” premieres March 27 at 8/7 c on ABC. – Co-written by Jaclyn Passaro.